Probiotics are live microorganisms that live in various parts of the body, and they’re vital for your dog’s health as your own because they essentially keep a balance between the good bacteria and the bad. Probiotic supplements for dogs are probably the easiest way to provide all the health benefits of these microorganisms to your canine friend. However, choosing the best dog probiotics can be overwhelming due to the many available choices on store shelves. The truth is you can buy any probiotic supplement as long as it is non-dairy, made from whole foods, and contains soil-based organisms. If you’re on a budget, you can make the supplements last longer by using a capsule to inoculate some raw goat’s milk or any other non-homogenized low-temperature pasteurized grass-fed organic milk. One capsule works wonders in a pint of milk which can be then mixed with your dog’s meal to last the whole week. Some of the more popular probiotics if Fortiflora for dogs. Fortiflora for dogs is a fantastic probiotic nutritional supplement for pets suffering with diarrhea and poor intestinal health. Probiotic supplements can be a good choice for dogs with an impaired immune system or those prone to digestive disorders. Most fermented foods are not tolerated well by dogs since they are dairy, soy, or fiber based. 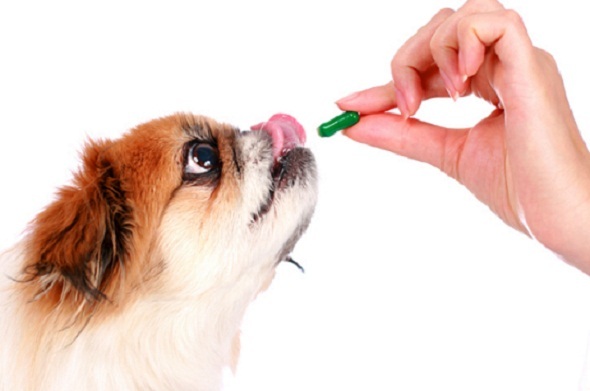 Probiotic supplements designed specifically for dogs can come in very useful. Yogurt is similar to sour cream, with reduced fat content and is made when lactose fermentation initiated by probiotic bacteria produces lactic acid. Yogurt for dogs adopts its characteristic tang and texture when lactic acid interacts with milk protein on a chemical level. There are a number of good bacteria strains found in yogurt, including Bifidobacteria, Lactobacilli, and S. thermophilius, among others. They can help prevent your dog from a variety of chronic fungal infections and gastrointestinal diseases. Yogurt for dogs is also effective in counteracting the side-effects of antibiotic therapy, particularly vomiting, diarrhea, and irritable bowel syndrome. You can add one to two tablespoons (depending upon the size of the dog) of yogurt once daily to your dog’s wet food to maintain their gut health. Make sure you buy plain yogurt and not the ones flavored with fruits or other agents. Also, look for ‘live and active’ bacteria culture while purchasing yogurts. This is an excellent source of probiotics for dogs since they are almost without milk sugars. Live culture is added to ferment the milk sugar or lactose. However, you will have to give your dog fermented milk right from the carton, since heating or cooking it destroys all the good bacteria. Buttermilk is rich in lactic acid bacteria which is beneficial to your dog’s GI tract. Buttermilk is known to reduce ‘tear staining’ in dog breeds susceptible to runny eyes, like cocker spaniels, boxers, English bulldogs and poodles among others. Some manufacturers carry powdered form of buttermilk as well designed specifically for dogs. These contain live cultures in inactive state that begin working once mixed in with your dog’s wet food. Kefir for dogs is similar to yogurt in texture and taste. However, it is made from goat’s milk using kefir grains. It can also be made using alternative milk or cow’s milk and kefir water can be made using coconut water or rice water. Kefir for dogs has a refreshingly tart flavor and contains loads of probiotics, vitamins, yeast, and proteins. You can easily mix half a cup of diluted kefir milk or kefir water in your dog’s bowl or as a separate snack. When buying kefir from the store, make sure it is unsweetened. Kefir for dogs offers multiple benefits from natural antibiotic and anti-fungal boosts to allergy prevention and healthy skin. They also help in increasing energy, reducing gas and heartburn, and even possibly helping stop cancerous cells from increasing in number. Sauerkraut is a great source of probiotics, but it is high in sodium and should only be used as a probiotic-enriched treat. Fermented vegetables, like sauerkraut and kimchi are known to produce up to 10 trillion CFUs. Dogs are known to prefer kimchi over sauerkraut due to the addition of umami flavors by way of fish sauce or shrimp paste. Make sure you ferment your own batch of kimchi, because the store-bought versions can be high on chili. By fermenting your own food, you also get complete control over the ingredients and prevent your dog from unknowingly ingesting something that is not good for their tummy. Sauerkraut or kimchi should be introduced gradually in your dog’s diet, especially if they have not had vegetable fiber before. You can gradually reach up to 1 – 3 tablespoons for every 20 pounds of weight. Goat milk, which is unpasteurized and non-homogenized, has the goodness of billions of natural probiotics. It has very less lactose as compared to cow’s milk, and does not cause the same digestive issues. This is one of the primary reasons why goat milk is recommended for dogs and other animals. You can give 2 oz. of raw goat milk to your dog daily for every 20 pounds of weight. You can enrich the goat milk with extra probiotics by emptying a supplement capsule in a lukewarm pint. Some probiotic bacteria find it difficult to survive the harsh stomach environment. Most bacteria perish and never make it to the small intestine. However, bacteria found in soft cheeses are known to find their way easily into the intestines after surviving the erosive gastric juices. Cheddar, Swiss, and Gouda cheese are known to contain lactic acid producing bacteria that kills infectious bacteria. Lactobacillus bacteria found in cheese also help in nutrient absorption from digested food to relieve constipation. However, cheese is a high-calorie food and you need to limit its portions to prevent obesity in your dog. When it comes to giving your dog all the goodness of probiotics, it is important to understand that a diverse, rich, and balanced diet is important. Good news is, there are a lot of ways to add probiotics to your dog’s current diet. You can keep your canine glowing with health by giving probiotic foods as well as supplements. Always give small portions when adding anything new to your dog’s diet and look for signs of intolerance or allergies.